So, will it be Orange juice or tomato juice that you will serve in this pair of Anchor Hocking Lido avocado juice glasses. These are one of the harder shapes to find. 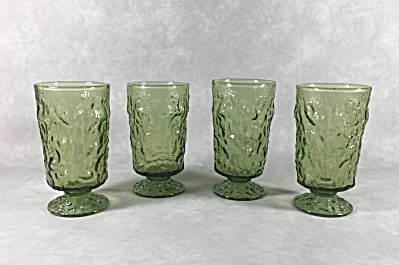 These glasses were made by Anchor Hocking from 1963 into the early 1970s. The pattern of this set is called Lido Glass, but the original pattern was introduced in 1959 as Milano Glass. Production of the Milano pattern spanned 1959 to 1963, and was only produced in Avocado Green and Crystal (clear). This pattern was made in ten different shapes and in the following colors: Avocado Green, Crystal, Honey Gold, Spicy Brown, Aquamarine, and Laser Blue.